Eating out was a rare treat when I was growing up in the Sixties. There were no McDonalds, with their Happy Meals and Playlands near Highland Park. Yes, I survived the first sixteen years of my life without entering the door of a McDonalds. My Mom was a stay at home mother who dedicated her life to taking care of her children. She made sure that I had dinner each night. There was always a meat, vegetables and a dessert of some kind. Occasionally she would treat us with a pizza that she made from the Chef Boy-ar-dee@ pizza mix. 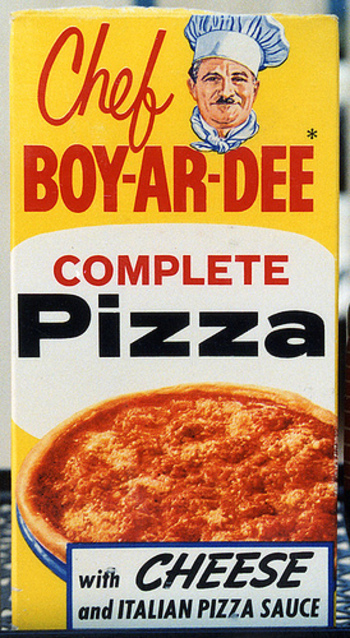 For this reason, I never remember eating a take away pizza while I was growing up. I always thought it would be nice to try the pizza from Lido’s on Six Mile Rd, but I don’t remember ever tasting a take away pizza while I lived in Highland Park. One of the first words that came out of my mouth was Kow-Kow. Whenever we would pass the Kow-Kow Inn on Six Mile, I would cry out the words, Kow-Kow with great excitement! My first remembrance of eating Kow-Kow Inn food was not in the restaurant, but the little white boxes that found their way into our home. Our meal of choice was Chicken Chop Suey. Only later, when I was out of high school would I visit Kow-Kow. The decor wasn’t fancy, but it made you feel like you were in an authentic Chinese restaurant. The two complete meals for eight dollars was a delicious bargain. The Kow-Kow Inn is no longer in business. A special thanks to Charles Powell for the photo. My first fast food experience, like most Highland Parkers, was the Red Barn on Grand Avenue and Woodward. We went there a few times when it first opened. My Mom probably liked the fact that she was able to get out of the kitchen. We would order our meal and then take our treasure out to the car and eat the food in the car. I would eat and look at the Granwood Hotel sign advertising rooms for four dollars. I also looked at the WMUZ sign on the side of the Grand Bible and Book store. We ate in the car because, in the beginning, the Red Barn only had only few places to sit. The seating consisted of what looked like white school desks facing the order counter. The food at the Red Barn was not health food. Their hot dogs were in toasted buttered buns. To this day, there is no hot dog like the Red Barn’s. I don’t know why a fast food franchise doesn’t try to sell this type of hot dog today. As for the fries, they were stringy and had no real taste. We would wash down this gourmet meal with a small carton of white milk. Mom never allowed us to order pop. 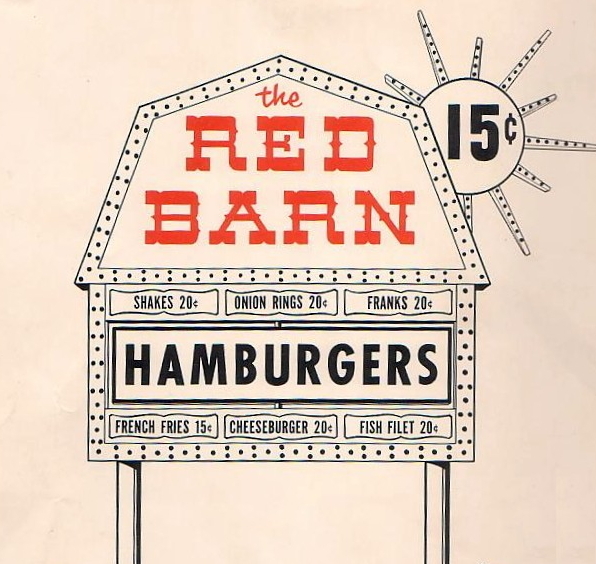 After my early childhood years, I would walk pass Red Barn on the way home from high school, but I never ate there again for some unknown reason. As the novelty of the Red Barn wore off, Mom took us to a more upscale restaurant called The Clock. This was a real sit down restaurant with a menu. The most fascinating thing about The Clock was that each booth had a its own little Jukebox. Mom would let us a pick out a song or two to have played at our table while we waited for our food. As a child, I never experienced eating the chili dogs at Red Hots. My Dad had his own favorite coney island restaurant which was the Nevada Grill. This was on John R off of Nevada in Detroit. I don’t remember much about this place, but Dad was sold on it. When I became an older teen, I began to venture out on my own to eat out occasionally. My favorite place was Red Hots. I would order two chili dogs and a Vernors that would come out of a machine. There was nothing to compare with this great combination. When I took my wife there a couple of years ago, she wasn’t impressed, but the chili dogs tasted just the same. Unfortunately, the Vernors came in a can. It didn’t have the same taste. There were a few other experiences of eating out in Highland Park. When I was in elementary school, one of my friend’s mother took several of us to Howard Johnson for his birthday party. This seemed rather excessive, but I enjoyed the novelty of eating at Howard Johnson. As a family, we never ate there because Dad didn’t like it. Even to this day, I avoid Howard Johnson. Though the Victor Bakery is not a restaurant, I remember that we would go there to buy fresh French Bread. This was my first experience with bread that had a hard crust and a soft dough inside. To this day, I still enjoy fresh baked French bread. The Victor Bakery looks much the same as when I was growing up. It is hard to believe that many people in my generation grew up without McDonalds and other fast food restaurants. However, I have no regrets. Eating out was a rare treat. I am thankful for the effort my mother made to keep us fed by cooking delicious meals at home, but I will always remember the rare treat of eating out. This entry was posted in Highland Park Memories and tagged Grand Bible and Book Store, Howard Johnson, Kow-Kow Inn, McDonalds, The Clock Restaurant, Vernors, Victor Bakery, WMUZ by markjemilbooth. Bookmark the permalink. (Beginning in 1964) I remember eating at Red Barn. It was better than nothing – stale hamburgers, soggy fries, etc…until the Barnbuster came into existence. I loved that. 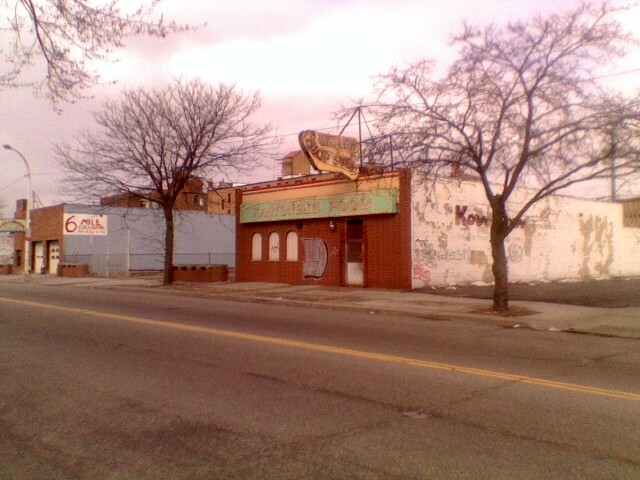 I liked Hi-Lo’s Hamburgers on Woodward and Buena Vista. Everything was cooked fresh even though it was a nickel higher than Red Barn. We would always want to go to McDonald’s when we were out of the HP city limits. My friends and I used to eat 5 cent donuts at Victor Bakery. Is it still in business? I loved Howard Johnson’s and their batter-dipped fried chicken when they had the Monday all-you-can-eat special. I saved my allowance. We use to play football and baseball on their park. And after the school band, orchestra, and chorus concerts our parents would take us there for desserts. I always had the strawberry shortcake. McDonald’s finally came, but it was at Six Mile (McNichols) and I-75. I would either ride my bike or walk (or run since I was practicing for the cross country team). What a memory you have. I remember most of the above, but I was not a meat eater until i was a teenager. However I loved Red Barn hot dogs and I liked the greasy fries also. The clock was good too. 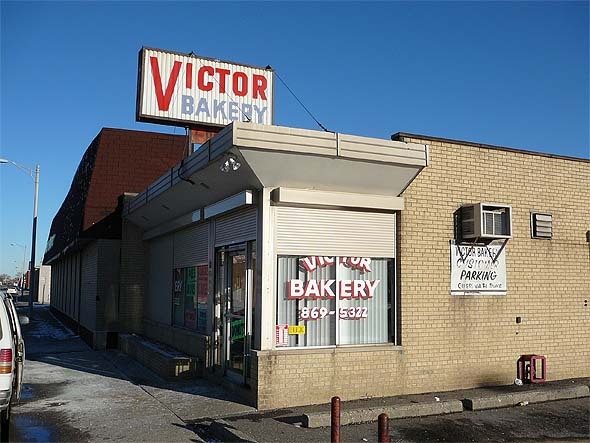 I used to stop at Victor Bakery sometimes on my way to Detroit to teach until I retired–excellent bread. I still remember Dad going into restaurants to make sure they had hot dogs, because that was the only dish you would eat. I wouldn’t eat beef, but I did like chicken. I had forgotten that too–but now I clearly remember it. 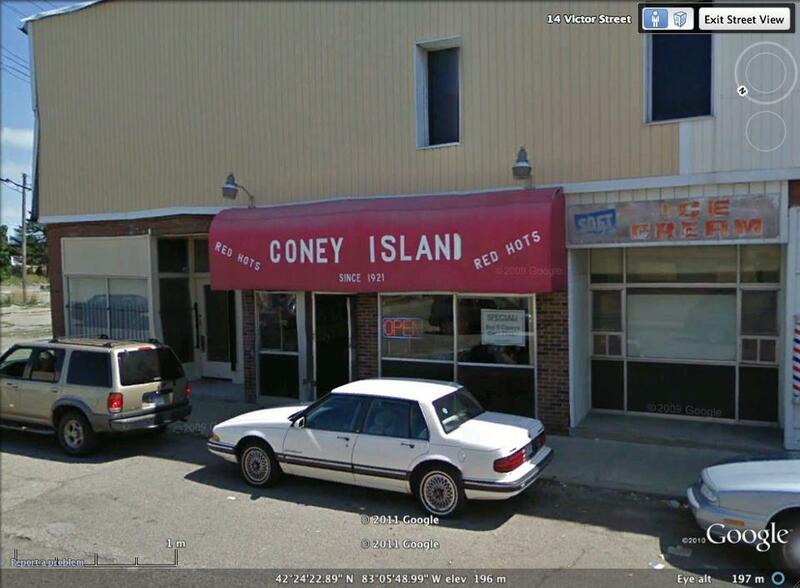 I suppose there was not a coney island on every corner like there is today. Great post. I was walking through the Packard Plant today and stumbled across an old matchbook from The Clock, which I’d never heard of before. After some googling, I found your post here. Not much written about the Clock, but from one other source, it seems as though they were all over Detroit and the surrounding area in the 60s and 70s. Anyhu, always great to see writing on the city’s history. Thanks. Thanks for reading my post about eating out. The Clock had good food. There was a Clock restaurant where I live now in Charlotte, MI. They were quite popular. I wish I had a better memory about the food. The Clock in Highland Park was on Manchester Ave. Between John R and Woodward. It was right across the street from the old Ford Plant. Remember discovering fried clams at Howard Johnson’s. What a treat! My Dad didn’t like Howard Johnson’s so I didn’t have much of an opportunity to eat there. I did answer on your other comment that I knew a Jonathan Dyell that went to Midland while I was there. You wouldn’t happen to be the same person. Jon is my younger (6 years) brother. He’s on Facebook, if you want to catch up. Yes, I did find him on FB and we are now FB friends. Thanks for the info. Again, thank for reading my blog. I thoroughly enjoyed your story, as it mirrors a lot of what I experienced growing up in Northwest Detroit in the ’60’s. Thank you for sharing. Thanks for reading my post. If you are interested I do have several other posts concerning different aspects of my years growing up in Highland Park. In our day, people didn’t eat out like they do today. It was a special treat to even go to Red Barn. Loved reading your stories. Very similar to my wonder years in Hamtramck. We had a Red Barn and Clock. Bunch of different coney islands like Genie’s Weiners, Al’s Corral, Onassis, Nick’s, Wally’s which was my favorite. This was all during the ’60s and ’70s. Thanks for sharing. And you’re welcome to visit our site, “I grew up in Hamtramck before 1985” I think you’ll enjoy it. Gary, thanks for taking the time to read my blog! I have enjoyed writing about Highland Park in my growing up years. I do have memories of Hamtramck. My Dad always talked about how great a tennis coach was there by the name of Jean Hoxie. I also played Peaches Bartkowitz’s brother in a tennis tournament. He beat me 6-2; 6-0. My Dad’s favorite furniture store was Laskie’s. My favorite toy store was in Hamtramck because they sold Avalon Hill games. I will have to branch out and write a post on Hamtramck. As for the page you mentioned, it is quite nice. I always enjoy seeing old photos. Hello Mark. You’ve managed to reactivate a few brain cells that hadn’t been active for a long long time. I worked at Uptown Radio back in the 60’s and 70’s. Went to the big Red Barn often. It was cheap and filling. Let me ask you if you recall a donut shop near 6 mile and Woodward near the southeast corner of the intersection? I used to go there often before service appointments but for the life of me, I can’t remember the name of it. By the way, I love your humble attitude revealed in your article about your tennis experience in high school. Dale, thanks for visiting my blog. I have enjoyed writing it. As for the donut shop, wasn’t it a Dunkin Donut shop at first and then later had a new name? I say this because my Dad use to call it Dinky Donuts because he thought they decreased the size of the donuts. If you have a photo of Uptown Radio, I would love to use it in the future. I hope to write about buying our first stereo which we bought from Uptown Radio. Think it might have been just Dunk Donuts. My favorite was (and it’s still there) Dutch Girl Donuts, on Woodward a block south of 7-Mile. Yes, another person shared that it was Dunk Donuts. I think that he is right. Come to think of it, I didn’t even have a camera back then!